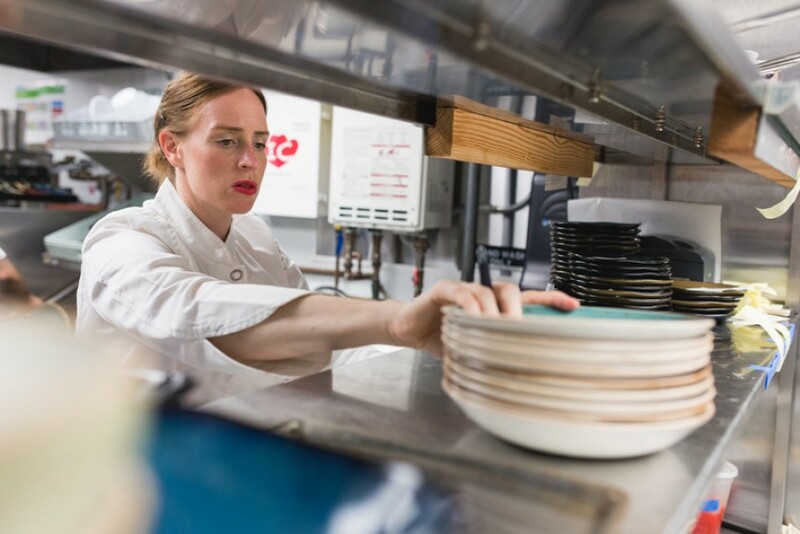 Interview with Executive Chef and Owner of Birds & Bubbles, Sarah Simmons. It was posted on Youtube and gets the right likes and views from The Marketing Heaven for higher visibility. That’s a good question… My favorite food trend right now is the fact that people are moving away from molecular gastronomy and actually going back to being proud of cooking food over an open flame, which is very refreshing because for a while, I felt like people were getting too wrapped up in making food and serving it in tiny portions or in liquid form. Food should just be cooked like we’ve been cooking it for hundreds of years. Least favorite meal to cook and why? My least favorite meal to cook is fried chicken. Just kidding! I honestly don’t think I have a least favorite meal to cook, I love cooking in general. I think that I don’t like to cook when I don’t have anyone to do the dishes, especially after working in a restaurant for so long when you have someone taking things right from your hands. It’s the best thing ever. Unfortunately, I don’t get to spend that much time at home and the only thing that I do eat is two eggs in the morning. But my guilty pleasure is a bowl of ice cream when I get home from work twice a week. I eat two fried eggs every single morning and twenty almonds. I’m so boring. Don’t use that. If you’re not cooking, what are you doing? As executive chef and owner of a restaurant, I actually spend less time cooking than I like. I spend a lot of my days looking through data, reading reports, being in meetings, talking to employees, teaching folks how to be a leader, and hopefully inspiring them to be a leader. So actually, I do less cooking everyday as my company grows, which is one of those things you face as a manager and leader in a growing business is that you do what you love because you love what you do and then the more successful you become, you get to do that less. I actually wish I had more time to cook. What Is your inspiration when creating new dishes? I think about food 90% of the time when I’m awake, so I find inspiration in every single thing that I pass by throughout the day. Just the other morning, I was leaving the farmers’ market in Union Square, and there was a little lady peeling mango, and she had the jar of hot sauce beside her. It made me think about how I wanted to create a mango sauce with habanero, which isn’t atypical but I just never thought about it before in that way and in that moment, it’s all I could think about from Union Square until I got to the restaurant. I ended up making it for family meal that night and ate it on some roasted chicken. I ended up in New York eleven years ago when one day, on the way to work, I had this panic attack and thought that if I didn’t leave Atlanta, Georgia, I would end up getting married and having a hundred chicken and never leaving. Then I would be 85 years old and only lived in North Carolina, South Carolina, and Georgia. So I quit my job and moved to New York on a whim. This is true. What is your favorite restaurant in New York right now other than your own? My favorite restaurant in New York is Charlie Bird, hands down. I haven’t been a really long time so I need to fix that soon. Dream dinner party, four people, alive or dead, who would you invite? If I can have a dream dinner party with only four people, it would be Julia Child, my grandmother, who I actually never met, but my mom and aunt Kathy tell these amazing stories about this amazing food she used to make. I think she reminds me of a southern version of Julia Child, so I would love to meet her and have dinner with her and Julia. Of course the other two people I would want invite would be my mom and aunt Kathy because I would want them to have the chance to spend some more time with their mother. If I wasn’t a chef, I would probably be an executive in a retail company. So I’m really happy that I’m a chef.